When it comes to cleaning and sanitizing—such as rust removal, unclogging urinals, and scrubbing tiles—one major requirement to be considered is, not only the effectiveness of the product, but also its safety. Most heavy-duty cleaners contain high concentrations of acid or caustics, which are considered hazardous to humans, surfaces and the environment. Using an acid replacement is one way to prevent chemical injury caused by the contact with acids and their fumes. Having an acid replacement cleaner can be just as effective as other products, while maintaining the proficiency to dissolve uratic salts, removes rust, and keep areas sanitary. One specific area which necessitates effective cleaning is bathrooms. Schools, public restrooms and particularly both hospitals and senior care facilities, require their restrooms be hygienic. Without the proper regimen of cleaning procedures and the correct product, the consequence can result in cross-contamination of surfaces, with dirt, dust, mold accumulating. A traditional soap cleaner will not be adequate to uphold the sanitary standard. - Rust will build up on pipes, urinals will accumulate uratic salt and mineral deposits, and ceramic tiles and grout surfaces may become discolored. Using a proven acid replacement cleaner such as “F-2002” from Chemex, can bring about the desired result for rust removal and ceramic tile cleaning. 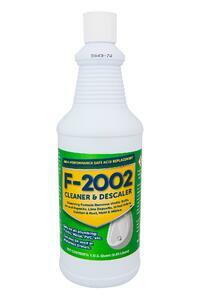 “F-2002” has a status of removing calcium, uratic salts, stains, and other buildup. Using it on urinals dissolves uratic salts and cleanses the toilet & urinal from accumulated mineral deposits. Other areas which may benefit from this acid replacement product are ceramic tiles. Tiles are often placed on bathroom floors, kitchen floors, and countertops. Tile surfaces accumulate dirt and mildew that are trapped in the grout lines. While this may not be noticeable at first, after some time the discoloration and malodor will become noticeable. Most cleaning/degreasing solutions will not be sufficient for this task. - Another concern is acidic cleaners that discolor or deteriorate surfaces. Using our safe acid replacement cleaner, “F-2002” will resolve that issue. “F-2002” is a concentrate acid replacement cleaner, meaning it safely and effectively replaces hydrochloric, hydrofluoric and phosphoric acids, found in typical bowl cleaners/descalers. Containing the mildness of dish soap, “F-2002” is non-toxic and non-corrosive, while having the durability and effectiveness of other heavy-duty cleaners. Instead of giving off fumes or strong odors, “F-2002” has no odor. When the viscous liquid from this cleaner is used, it clings to both vertical and horizontal surfaces. This quality allows it to quickly clean, remove rust and penetrate effectively into grout lines. When using “F-2002” as a urinal cleaner it will continue to dissolve uratic salts and corrosion, in your urinal drain lines, leaving behind odor-free and rust-free pipes. This acid replacement product from Chemex is a 25:1 concentrate, which provides rapid effectiveness. While it may smell and appear to be mild, it possesses the aggressiveness and effectiveness of acidic cleaners. 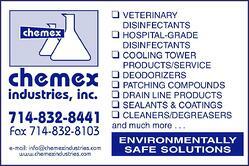 It is a safe and biodegradable product that may be used in rust removal, tile cleaning, and urinal cleansing. Any area that constantly receives hard water deposits can benefit from this acid replacement cleaner and the results it provides. Please call us with any questions. We can answer your technical questions.